A “stolen” 10m-long (35ft) Soviet-era anti-aircraft missile has exploded at a recycling centre in eastern Russia, killing two and injuring one. 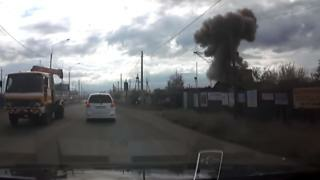 Russian media were alerted to the explosion of the large-scale missile in the city of Chita after a YouTube user uploaded a car dashcam video showing the moment of the blast. The missile was an S-200 Angara, known as the SA-5 “Gammon” in Nato countries. They have been in service since the 1960s, but are nowadays superseded by the S-300 and S-400 surface-to-air models. It is unknown how the missile came to be at a recycling plant. Local news website by24.org says that the seven tonne missile “had been stolen” from a military base by persons unknown and taken to the facility in exchange for cash. It had likely exploded while recycling workers were trying to dismantle it. News website The Insider says that emergency response workers later found another intact rocket from the S-200 missile system. The incident has ignited lively discussion on Russian social media, with many asking on popular social network VKontakte how it came to be at a recycling plant in the first place. “What was a missile doing at a non-ferrous scrap metal collection point?” asked Demid Tkachenko. “We’ve got so many rusty weapons in Russia that people are selling for scrap,” added Mayya Yarovaya, who said that the consequences of this incident “are tragic”.